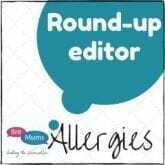 Over the past few years now my experiences of allergies has been pretty vast, and I have spoken to thousands of mothers who have found themselves in the position that I once did – breastfeeding a child with CMPA (or suspected CMPA) or other food allergies. It’s overwhelming, it’s scary, it’s worrying and concerning. It’s also often made worse by poorly informed health care professionals, or well meaning friends who unwittingly give out outdated or incorrect advice. I’ve heard so many myths, so many untruths, so many totally ridiculous ideas and beliefs about CMPA and it’s so frustrating knowing that there are parents out there who have been badly informed. 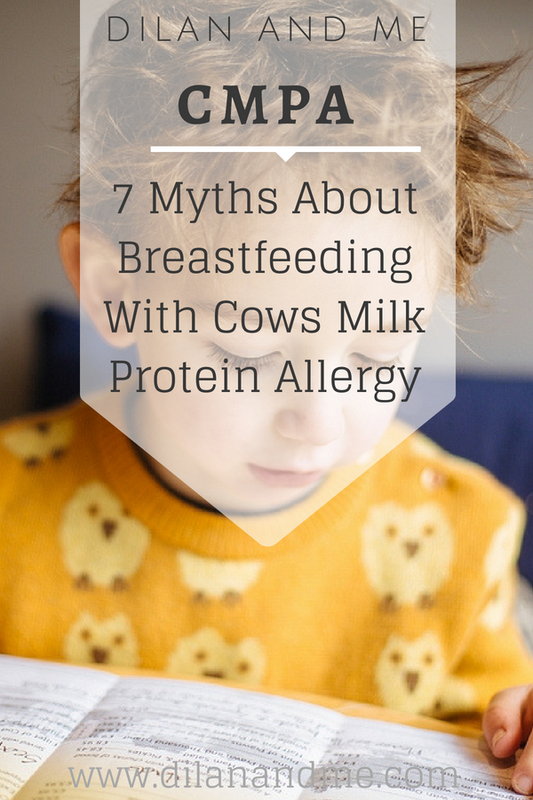 Here are 7 myths about breastfeeding with CMPA – and the truth behind each one. Something I repeat several times a day – There is NO SUCH THING as CMPI (Cow’s Milk Protein Intolerance). You cannot have a dairy intolerance. The term CMPI is a very outdated term, so if a health care professional uses it you can safely assume that all of their CMPA knowledge is also outdated. CMPI was used to describe what we now know is non-IgE CMPA. Whether your child experiences hives, reflux, eczema, constipation or anaphylaxis, it is due to an immune system response and therefore it IS an allergy. For more information on IgE and non-IgE CMPA check out the CMPA FAQs and this fact sheet. This is important, because often I hear from mothers who’s children are “just intolerant” and it seems like it’s not taken quite as seriously as what I’ve seen people refer to as “a true allergy”. In actuality non-IgE CMPA can be just as serious as an IgE allergy in terms of how much harm it can do to a little one, and how much pain exposure to dairy could leave them in. Nope!! This one really irritates me. Lactose intolerance and Cows Milk Protein Allergy are NOT the same thing, in fact they are completely different. Cows Milk Protein Allergy (CMPA) is becoming increasingly common amongst young children, presenting in approximately 3-7%. It exhibits itself in a wide variety of symptoms including any of the following: eczema, reflux, vomiting, diarrhoea/constipation, hives or other types of rashes, conjunctivitis, poor weight gain, “colic”, congestion, I could go on and on. Symptoms will improve once mum has cut out cows milk protein from her diet, as this will make her breast milk free from the allergen. Lactose intolerance in comparison is very rare in infants, and will result in a very poorly child. Symptoms are severe and gastro related only – no rashes or eczema, and will most likely result in a baby being ‘failure to thrive’. Symptoms will NOT improve by a mother changing her diet, as breast milk contains lactose regardless of maternal diet. In fact breast milk actually contains more lactose than cows milk does, so if anyone tells you that you can improve your child’s symptoms by going lactose free then you’ll know they are talking nonsense. To be clear – if your child’s symptoms have improved after removing dairy from your diet this is NOT lactose intolerance. The only extra thing to look out for here is Secondary Lactose Intolerance, which can be the result of gut damage from undiagnosed food allergies, or something like a severe stomach bug. When the gut lining becomes damaged the body may struggle to produce enough lactase, which is the enzyme needed to breakdown lactose. It is a temporary condition and will improve once the gut is able to heal itself. Breastmilk has lots of healing properties, so will help to support the gut repairs. If you suspect your babies gut may have been damaged you may want to consider introducing some probiotics to help also. Well, I’ve got a group of 3000 women who will show you otherwise! Sometimes you get people who vaguely understand some of point 2, so they know that breast milk contains lactose regardless of what you eat. Therefore, if they still believe (almost definitely wrongly) that your baby is suffering from Lactose Intolerance they will insist you need to give up breastfeeding. Sometimes they just tell you that you can’t breastfeed because they honestly don’t know what else to say. It sounds ridiculous, and it is, but I know first hand that mums are being told this. Probably once or twice a week I hear from a mum who has been told by her doctor/health visitor/dietitian that moving to a dairy free formula is the only answer. I could write a whole essay on the reasons behind this – the questionable studies funded by formula companies, the pressure on women in general to second guess their bodies and doubt themselves constantly, the way it’s perhaps viewed as ‘easier’ by some health care professionals to write a prescription instead of talking a new mother through a dairy free diet. Instead though I’ll tell you this – it is more than possible to continue to breastfeed a child with CMPA. I know that because I spent two years doing it, and I spend every day now supporting more mums who do it too. Mums who now have happy, strong, thriving, reaction free babies who are very happily fed Mummy’s milk. Continuing to breastfeed a child with CMPA means you’re still exposing them to all those magical healing properties I mentioned above, and avoiding the risks associated with formulas. Plus, you’re busy saving the NHS money because that dairy free stuff is expensive, so really the GPs ought to get behind it a bit more! This is a myth I feel really passionate about busting for several reasons. If you haven’t already then please do check out the dairy and soya free treat list right now! a) they are still very geared towards the gluten free market. You will find plenty of milk free things on the shelves, but they are very often made without wheat also. Gluten is tasty and gluten free products are often an acquired taste. And why get acquired to that taste when you don’t actually need to be in that section? New studies actually show that you should avoid eating gluten free products unless it’s medically necessary for you to do so. Example – I often hear from mums who are using gluten free bread because they assumed they had to. The truth is that most bread is dairy free so there’s no need. Even if you’re soya free too most supermarkets have a few options on the bread aisle (lots mentioned on the list), giving you no reason to have to go without gluten. Gluten free bread isn’t the same at all, and as well as that it’s a whole lot more expensive, see below! b) it’s a very expensive section. Being free from anything does tend to put the price of your weekly food shop up a little, but it doesn’t need to mean you are paying free from prices for everything. If you are just dairy free, or even dairy and soya then you should be able to find a huge range of yummy things on the regular aisles. Often products from the value ranges will be dairy free, and the cost difference between those and their free from match will be huge. Example – if you’re dairy free you might be looking for biscuits (who isn’t). You could head straight to Tesco free from section and pick up some free from digestive biscuits – 90p for 160g. Or you could head to the biscuit aisle and find a huge variety of safe biscuits including bourbons, oreos, party rings or ginger biscuits. You could grab some Tesco own brand Plain Chocolate Digestive Biscuits which are only 60p for 300g. You’ve saved yourself 30p, got double the amount of biscuit, managed to get ones that are chocolate topped too AND they’ll taste way better. Easy! If you do find yourself needing to shop in the free from section, due to being wheat free or just unable to find a “normal” alternative then don’t worry because it really does taste a lot better than it used to. Just make sure you aren’t shopping there for things you don’t have to. This or any kind of variation on this is really annoying, and a little worrying to me. Some mums are told that just a little bit is fine, or that they’d be okay to eat dairy as long as they don’t feed/pump and dump for the next x amount of hours. Some mums are told “baked milk won’t cause a reaction” or “you just need to cut out milk, yoghurt and cheese”. The truth is that further down the line you may actually discover that your little one can tolerate baked milk. You may discover that your little one doesn’t react through breast milk and you actually are safe to eat it in small amounts. But these are things that you need to trial and discover later on, not when you’re first starting out and you’re just desperate you get baby healthy and reaction free. To confirm CMPA in a breastfed baby you need to eliminate the allergen for around 6 weeks. And I mean really, properly eliminate with no slip ups or “cheating”. If you’re still eating baked milk or having “little bits” you will find it really hard to properly confirm whether or not there is an allergy. Plus if there is you are risking causing some real unseen damage on the inside. As far as having some dairy and then not feeding for a while goes, not a smart move. No one in the world could tell you how long it will take for your milk to be dairy free again after eating something you shouldn’t because it’s so different for everyone and depends on so many things; so you’ll either be forced to go days and days without feeding (risking your supply and your nursing relationship) or you will end up exposing your baby to cows milk protein and causing a reaction – not something you really want to be doing. Being dairy free does seem hard at first, but it gets easier. Plus – if I had to choose between Dairy Milk or a happy and healthy baby, it’s a hands down choice for me. Often mums have been terrified about going dairy free because they’ve heard about all this evil hidden milk just waiting to catch you out. I’ve seen ridiculously long lists circulating around Facebook, listing 101 ingredients that may or may not be derived from milk. I’ve heard of mums being advised to avoid lactic acid, cocoa butter, and a whole host of other things which actually are dairy free and perfectly safe. Occasionally if it’s something really obvious (like cream, cheese or whey) then it may not say milk, but it should still be highlighted in some way. This is true for all top 14 allergens, which makes is fairly easy to read labels quickly and efficiently, and establish whether or not something is safe. Is it a bit of a ball ache checking labels? Absolutely yeah. But is it necessary to memorise 20 different chemical words for milk derivatives or carry around a huge list of possible offenders? Absolutely not no. This one gets the most eye rolls from me, because I wouldn’t have spent hours and hours and hours creating these webpages if this was true. I wish it was, but unfortunately again I’ve got a group full of over 3000 women who can show you differently. The facts are that most CMPA babies will be able to tolerate cows milk through their mothers breastmilk. The reasons for this are still uncertain. Less than 1% of babies will react through bm according to the stats, but I’ve seen a lot of mums who have eliminated after they’ve started weaning (and seen clear reactions) and then started wondering if their baby’s previous colic/eczema/conjunctivitis/etc etc was actually down to CMPA….